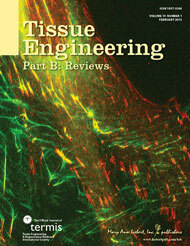 An immunofluorescence image captured by Dan Roy has been featured on the cover of the February 2013 issue of the journal Tissue Engineering Part B. The image is from the recently published paper by Roy and Hocking titled Recombinant fibronectin matrix mimetics specify integrin adhesion and extracellular matrix assembly. Dan Roy recently completed his PhD in BME in the laboratory of Professor Denise Hocking and is currently a post-doctoral fellow at the U.S. Army Institute of Surgical Research in San Antonio, Texas. Dr. Hocking is an Associate Professor in the Department of Pharmacology and Physiology and member of the Rochester Center for Biomedical Ultrasound. For further details, see the article by Roy and Hocking in Tissue Engineering, Part A, 19:558-570; 2013.